BALDWYN, MISSISSIPPI — When possible on these geological field trips we explore the local culture and history of the region in which we are temporary guests. This morning we visited the small Civil War battlefield of Brice’s Crossroads (June 10, 1864) in Lee County, Mississippi. It lies between our field sites at Blue Springs in the south and Owl Creek to the north. 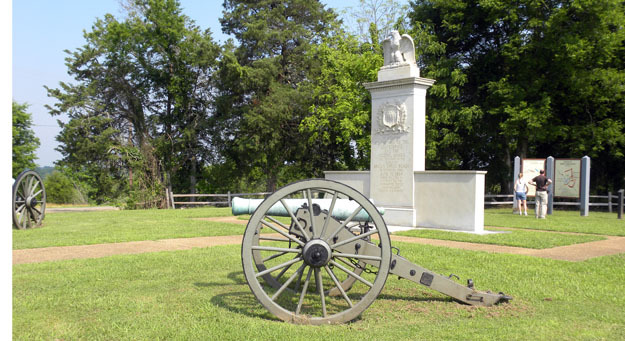 The center of the battlefield is marked by two cannon and a stone monument which memorializes both the Union and Confederate dead. A Confederate cemetery is nearby. At the time of the battle, Union commander General William Tecumseh Sherman was conducting his famous March to the Sea through Georgia and other southern states. (One of his soldiers was Corporal Julian Adolphus Wilson of the 57th Illinois Infantry — my grandfather’s grandfather.) Confederate General Nathan Bedford Forrest and his cavalry threatened Sherman’s supply lines, so Union General Samuel Sturgis was sent into northern Mississippi to stop him. With superior tactics, Forrest decisively defeated Sturgis at Brice’s Crossroads, forcing a long retreat. It was a rare Confederate victory in that time and place, but Forrest was ultimately distracted from his goal of cutting Sherman’s communications. Graves of some of the Confederate dead from the Brice’s Crossroads battle.